Travel back in time to 1930’s Chicago; prohibition was the law of the land, yet gangsters made their own rules in smoke-filled, dim-lit backrooms and power was money, while money was power. Get in on the underworld action in Chicago Gangsters slot by Playson, a 5-reel 20-line slot featuring Wild symbols, Mystery symbols, Bonus Game and in-game Jackpots. City Wild Symbol – The City of Chicago symbol is the game’s wild and can substitute for all symbols except the Bonus to complete wins. Mystery Symbols – During the Main Game, Mystery symbols land as face-down cards to change into a group of alike symbols. It turns out to be a great gamble when cards disappear and you see a slick gangster beneath – you’ve got the top paying symbol and the Big Win is on its way. Bonus Game – 6 or more chip-like Bonus symbols trigger the Bonus Game. 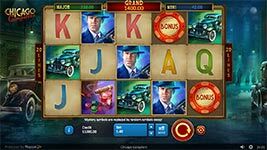 During the Bonus Game, after the series of re-spins, each Bonus symbol pays, and when the whole field is covered with symbols the in-game Grand Jackpot is paid. Major and Mini Jackpots land on the reels as special chips.